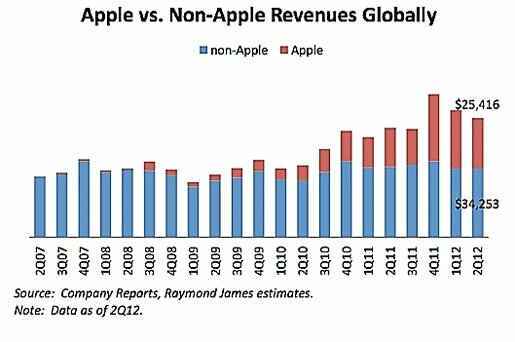 Raymond James Equity Research found that in Q2 2012 Apple shipped just 6 percent of the smartphone and tablet market, yet took in 43 percent of the total industry revenue and an enormous 77 percent of the industry's operating profits! Everyone knows the iPhone and iPad are top of the range mobile gadgets and that Apple don’t design things for a price but for a function. However new research brings into question how inflated these prices are. New figures from analysts at Raymond James Equity Research shows that Apple are indeed raking it in and making a lot more money on each product sold than any other competitor.